Smoked Salmon Dip is an easy appetizer for Christmas, New Year’s, or any other holiday party that only requires a few simple ingredients and can easily be made dairy-free, low-carb, and keto diet friendly. You will learn how to make this salmon dip recipe with cream cheese, yogurt, lemon, and dill in under 5 minutes! We are throwing a Christmas or New Year’s party or weeknight get-together and need a few snack foods. The hubby and I go on a backpacking trip and enjoy it the first night before it gets too warm without refrigeration. When we (rarely) get bagels and the epic combo of smoked salmon and cream cheese is on the menu. Those times I am STARVING in the grocery store, see the smoked salmon packages, and devour it as I walk through the store in an attempt to avoid buying everything on the aisles. Then something occurred to me, why not turn this delightful delicacy into a smoked salmon dip? Combine the creaminess of the cream cheese, the smokiness of the smoked salmon, and the freshness from a bit of dill and lemon zest! And do you want to know the best part?? I have made this smoked salmon dip full of dairy as well as dairy-free and they both came out incredible! Not to mention, it is very low-carb and a great appetizer recipe for guests on a keto diet when served with celery sticks or bell peppers. 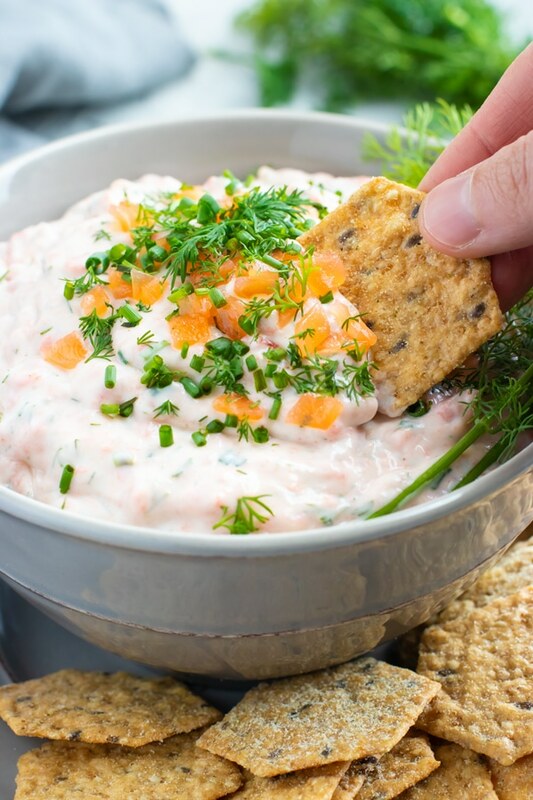 So if you are in need of a super quick, but kind of fancy dip or appetizer to bring to an upcoming party, look no further than this salmon dip recipe! Below you will learn what ingredients you will need, how to make smoked salmon dip, how to store it, how long it will last, and what to serve it with. 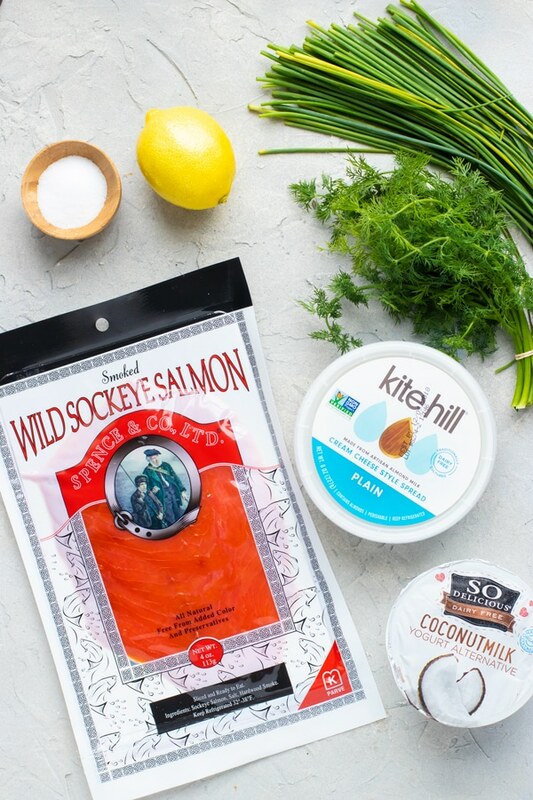 Wild smoked salmon – feel free to use Nova, Sockeye, or any other kind you enjoy the taste of on its own. Yogurt – Make sure you get plain yogurt, but Greek, regular, or dairy-free will work great. Cream cheese – The cream cheese in a block or a dairy-free variety (like Daiya’s or Kite Hill’s) work equally as well. 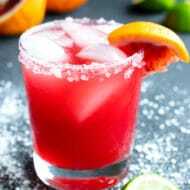 Lemon juice and zest – Fresh lemons work best, but bottle lemon juice can work if you do not have one. Fresh dill – A necessity for this recipe! Chives – If you are unable to find chives, substitute for green onions. How to Make Salmon Dip? 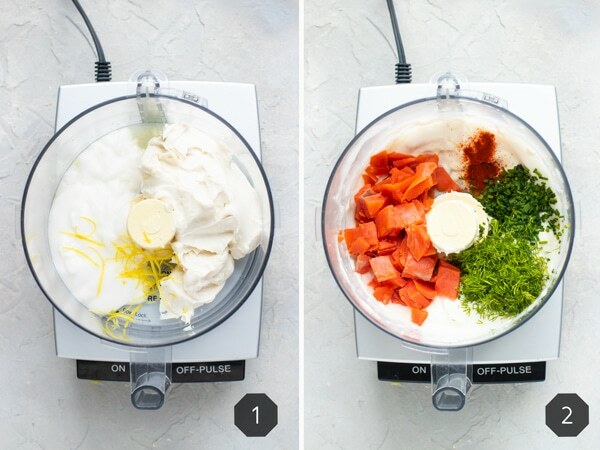 Once you have gathered all of your ingredients, you will need either a large food processor or high speed blender that you are able to pulse. My personal preference is the Cuisinart 11-Cup food processor since it has the pulse function and can hold a double-batch of this smoked salmon dip. You will first add the cream cheese, yogurt, lemon juice, lemon zest, and process for 20-30 seconds. Next, you will add the dill, smoked salmon, and seasoning ingredients. Pulse until just combine. Smoked salmon dip tastes best served slightly chilled. If your ingredients are too warm after processing, simply return the salmon dip recipe to the refrigerator for 30 minutes before serving. Since smoked salmon dip is full of temperature sensitive ingredients you will want to store it in the refrigerator between servings. 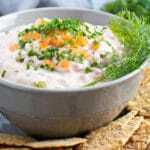 Salmon dip will last for up to two weeks if stored in an air-tight container in the refrigerator. However, if you used cold smoked salmon the dip will only last for up to 3 days. Can I freeze salmon dip? 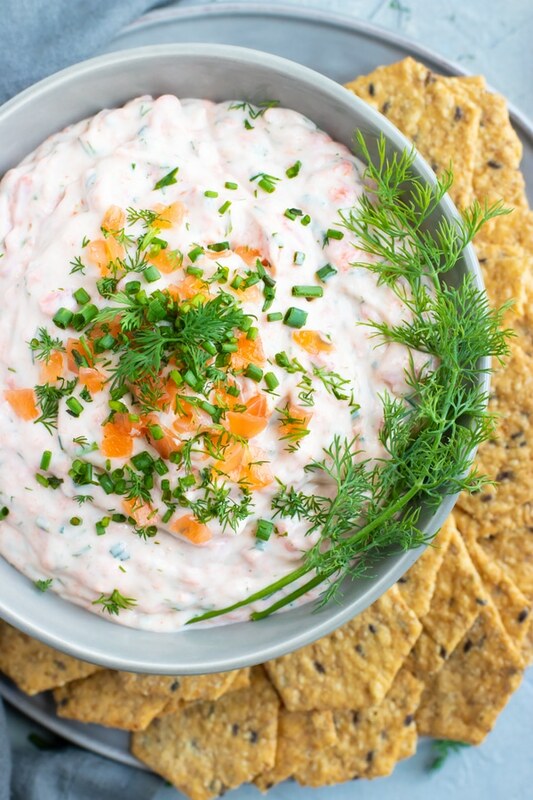 Yes, you can freeze smoked salmon dip (if you are lucky enough to have any left!) Store the dip in an airtight container for up to 3 months in the freezer and let thaw in the refrigerator for a day or two before serving. The dip may separate slightly after thawing due to the yogurt. If this happens just give it a few good stirs and it will be good to go! 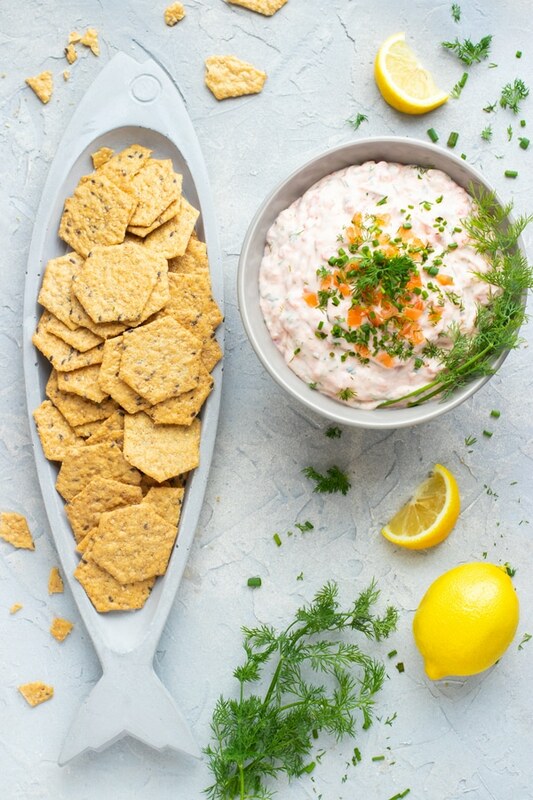 What to Serve with Smoked Salmon Dip? You can even serve this smoked salmon dip as a spread on some bread and turn it into a delightful sandwich! Smoked Salmon Dip is an easy appetizer for Christmas, New Year's, or any other holiday party that only requires a few simple ingredients and can easily be made dairy-free, low-carb, and keto diet friendly. Add cream cheese, yogurt, lemon juice, and lemon zest to the bowl of a large food processor. Process for 20-30 seconds, scraping down the sides halfway through. Add dill, salt, smoked salmon, chives, and paprika. Pulse 5-10 times, or until ingredients are well incorporated. 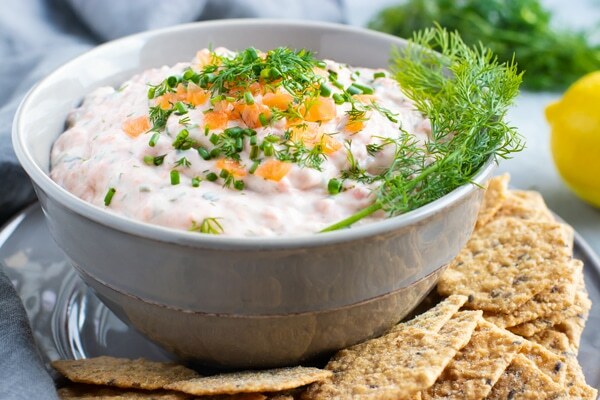 Serve immediately or refrigerate smoked salmon dip until ready to serve. Sprinkle with additional chives and serve with crackers, celery, or carrots. Enjoy! You can also use a dairy-free cream cheese spread (Daiya and Kite Hill make some) and a dairy-free yogurt. Nutrition facts are calculated without crackers, celery, or carrots. Perfect timing! I’ve been looking for an appetizer / dip for Christmas Eve! This looks like a winner! Yum! I could eat the entire bowl. Lol. I could, too. It’s delicious! Thank you for your comment and rating!